Looking to upgrade your boat’s aging instruments? The fundamental sensors that make up any sailing instrument system include wind speed and direction, boatspeed, water depth and water temperature. These transducers detect variations in the physical world around the boat and convert that information into an electrical signal. Buying your transducers as part of a kit with instrument displays is a reliable way to make sure that everything is compatible. However, if you are attempting to integrate new and old equipment or use devices from more than one manufacturer, transducers should be selected carefully. Most transducers output an analog signal that must be converted to a digital data format by a dedicated instrument display, or alternatively a “black box” computer. It’s not until this conversion happens that the signal can be shared with other devices on a boat’s network. A growing trend is to have “smart transducers” that do the processing internally before outputting useful data onto the boat’s NMEA 2000 network. Depending on your desired level of sophistication, the data that is provided to your instrument displays may need to be adjusted, averaged or offset in one way or another before it becomes useful to you. Much of this processing is overkill for cruisers. However, if you are solo-sailing on a performance boat through the Southern Ocean, your needs may be different. The latter scenario, for example, would call for an autopilot that can keep you on course in 20ft seas by adjusting its steering profile based upon critical data received from a central computer, which is constantly processing data from a wind transducer, hull speed transducer and probably a 3D motion sensor. Instruments, transducers, black boxes, autopilots, chartplotters and multifunction displays provide the most value when they can communicate with each other, sharing data on a common network, and the NMEA 2000 network protocol has become the defacto standard for making this happen. Therefore, if you are installing instruments from scratch, it’s a good idea to select devices that are all NMEA 2000 compatible. There are workarounds for mixing other networks, such as the older NMEA 0183 and other proprietary protocols. However, mixing network types could create more opportunities for failure in your system. After collecting, processing and sharing environmental data, it’s time to make it visible and useful for the crew.Some instruments have dedicated displays for specific types of data, while others offer the ability to view almost any data types provided on the network. The specific types and number of instrument displays that you choose to install on deck (as well as their mounting locations) will depend on the type of boat and how it’s used. In general, it’s a good idea to put the instrument displays where they will be within your normal line of sight while sailing. The term “black box” has been adopted by many marine electronics manufacturers and retailers. Although the name is more than a little vague, and even a bit menacing, black boxes are just small computers. They are built for a variety of uses, but generally, they receive a certain set of inputs in the form of analog signals or digital data and then output them in a usable form. Garmin (garmin.com) has come a long way in the sailing market. Since the acquisition of the Nexus brand, it now provides products that are very competitive at every level in the marketplace. With a three-bladed propeller and twin tail fins, the GNX Wind Wired Sail Pack ($1,599) is the most unique-looking wind transducer on the market. A wireless version is also available but is not recommended for masts taller than 50ft. The DST800 through-hull smart transducer has you covered for depth, speed and temperature in one unit. Two monochrome instrument displays come standard. Also in the box is Garmin’s GND 10, a “black box” device that bridges the gap between the proprietary Nexus network and NMEA 2000. For greater functionality, some sailors may want to add a GMI 20 ($549) full-color instrument display. 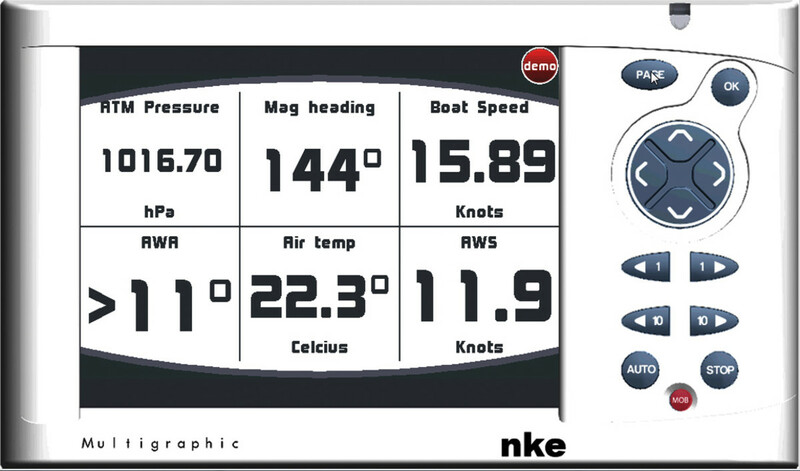 This NMEA 2000 instrument can clearly provide depth, speed, wind and over 100 other vessel parameters. Racers, on the other hand, will appreciate the company’s large-format displays designed for mounting at the mast. The GNX 120 ($899) and GNX 130 ($1,499) come with the option of white or color digits and offer variable visibility settings for any lighting condition. Multiple display configurations are available and can be controlled from the GNX keypad ($179). 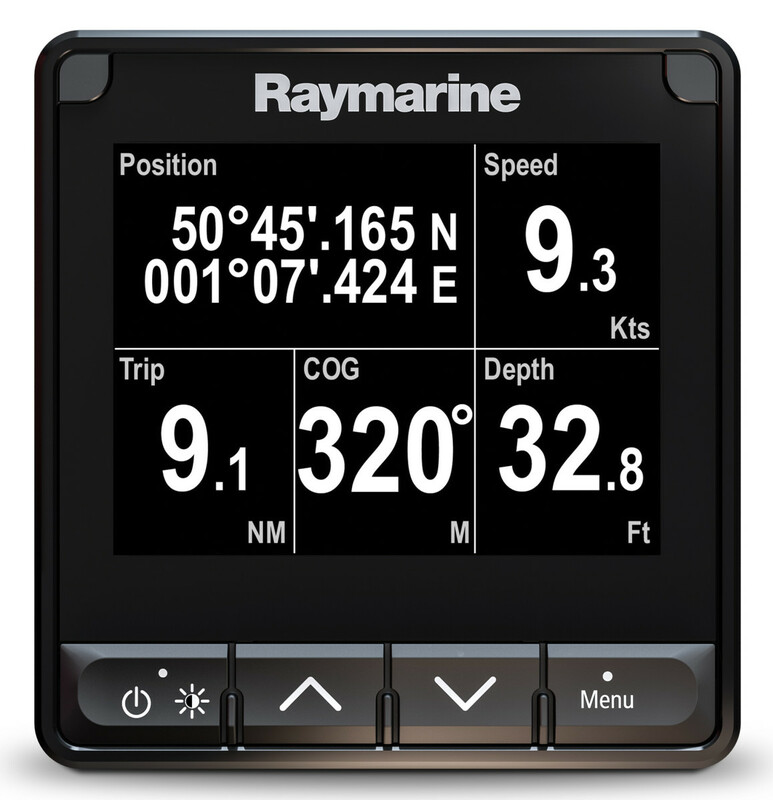 Raymarine (raymarine.com) has a large lineup of instruments and displays. The company’s wired devices operate on various network types that have standard protocols, but proprietary names. In 2011 Raymarine acquired the popular Tacktick wireless instruments brand, now known as Raymarine Wireless. Recently it announced the release of the MicroTalk Wireless Sailing Gateway, which allows bridging of all Raymarine wired and wireless instruments. The i40 instruments are the smallest and least expensive offering from Raymarine. As many other product lines move toward a more multifunctional approach, the i40 still offers the ability to connect directly to an analog transducer for a dedicated display. Data can be shared across displays via the original SeaTalk 1 network. For their size, they offer crisp readouts of essential data and can be networked with other NMEA 2000 instruments and MFDs using a SeaTalk 1 to SeaTalk ng bridge device. The i40 Wind System includes an instrument display and masthead transducer ($439). The i40 Speed System with through-hull speed transducer goes for $279. Also available from Raymarine are the i50 Digital and i60 Analog Instrument Systems Pack ($1,599). This basic kit is complete with transducers and three instrument displays. An i50 for depth, i50 for speed and an i60 with analog dial for wind. These offer SeaTalkNG connectivity and can also be adapted to run on a NMEA 2000 network with the addition of a simple pigtail adapter. For more data and full color, add the i70s display ($479) to any SeaTalk ng or NMEA 2000 network. The 4.1in color LCD will display just about any data you desire. The Raymarine wireless line is entirely solar powered, rechargeable and networks wirelessly using the MicroNet protocol. DIY cruisers will definitely appreciate the easy installation of a wireless display and analog wind instrument. The wind transducer is solar powered so there is no cable to pull up the mast. The wireless depth, speed and temperature displays can be solar powered as well, or they can be wired into the boat’s DC system. For the performance-minded sailor, the wireless Maxi ($1,389) and Dual Maxi ($1,189) displays support many race-specific features over an above the standard instrument data, including start line, line bias, wind shift readings, race timers and airflow correction. Small boat and dinghy racers can take advantage of the company’s Micro Compass and Race Master instruments. A new trend for cockpit instruments? Over the past five years, we’ve seen the price of chartplottersand multifunction displays drop significantly. Meanwhile, the popularization of N2k transducers has made it incredibly simple to connect and display simple depth, speed, temperature and wind data on small (5in) chartplotter displays. This prompts a question: Are dedicated instrument displays necessary for basic installations that already include one or more chartplotters? 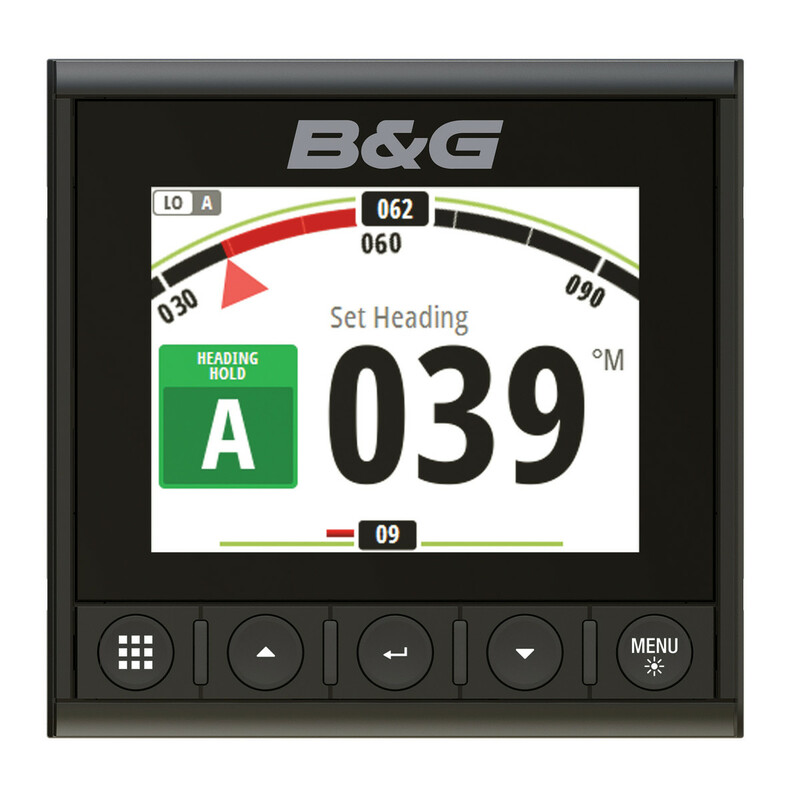 Founded in 1955, B&G (formerly Brookes & Gatehouse) is one of the oldest brands in marine electronics and continues to focus on providing features specifically for the sailing market. In 2005, B&G (bandg.com) was acquired by the Navico Company, joining Lowrance and Simrad Yachting. Today, its electronics are widely recognized for their role aboard boats competing successfully in such events as the Vendée Globe, the Volvo Ocean Race and the America’s Cup. 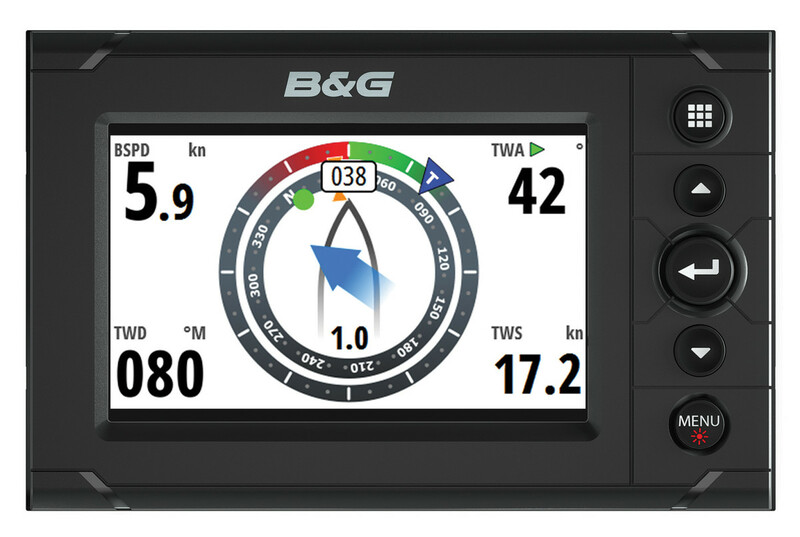 The B&G Triton2 Speed/Depth/Wind Instrument Pack ($1,399) stands out for its single, 4.1in multi-function display and use of all NMEA 2k transducers. No black boxes are needed. The display and all transducers are also powered from the network, so there are no additional DC cables to run. When it comes to compatibility, it doesn’t get better than this. That said, owners of smaller cruising boats and daysailers may decide to forgo the Triton2 display ($549), and instead upgrade their instrumentation and chartplotting on a Vulcan 5 MFD ($419). Observant shoppers will note there is actually a cost savings associated with this change. The drawback is slightly increased power consumption and the need to provide dedicated power to the Vulcan unit. Another upgrade that can be made to the system above is adding the ZG100 Antenna ($199) for magnetic heading and GPS location. 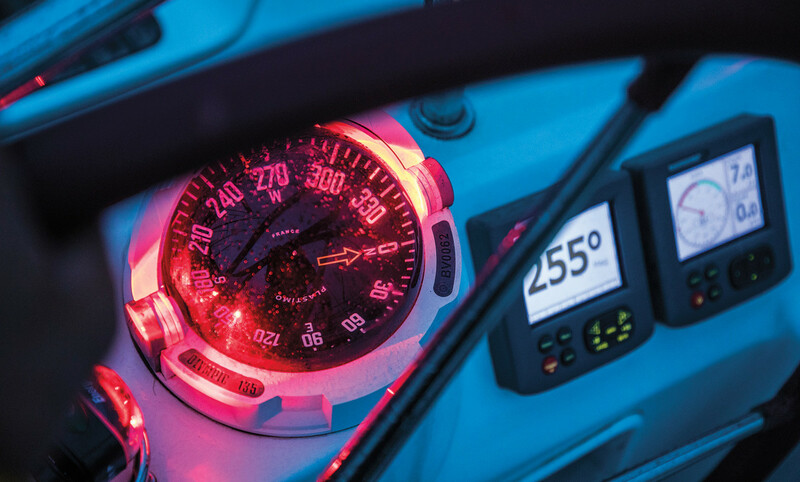 Additional Triton2 displays or Vulcan MFD’s can also be added anywhere you need access to your instrument data, making it an easily expanded system can satisfy even the most adventurous passagemakers. Racing yachts, on the other hand, will want to use the B&G H5000 system. This system includes a central computer ($1,499) that can collect data from a wide variety of precision instruments available as expansion modules. The 5in H5000 color display ($1,099) is packed with racing-specific features. Setup and calibration are easily done using a browser-based interface on your computer. Among the sensors and expansion modules available are a high-resolution barometer, network alarm and 3D motion sensor. Headquartered in France, NKE (nke-marine-electronics.com) has been developing sailing electronics for over 30 years, and its products can be found aboard some of the world’s most elite racing yachts. The company’s basic speed, depth and wind package ($2,795) includes three transducers and a monochrome LCD Performance Display. Add a full color 5.7in Multigraphic Display ($1,628) for history graphs of wind, barometric pressure, temperature and any other data available on the network. NKE’s Regatta Instrument Package ($5,475) includes a three-LCD mast display and wired remote and fluxgate compass. Even higher-resolution data can be attained by adding the Regatta Processor, which allows the measured wind data to be corrected using the boat’s motion and acceleration to achieve a more accurate true wind reading. Whether you are upgrading an existing system or starting from scratch, it’s important to select components or packs that play well together and allow for future expansion. Self-installation is well within the ability of many DIY’ers, but be careful not to overcomplicate things. The use of MFDs in place of separate instrument displays is becoming a real trend. Transducers that output NMEA 2k data are excellent, but they usually only update at 1Hz (1 time per second). This might not be fast enough for racers who need their data to be displayed in real time.